Thanks to the generosity of the BC Lung Association, a new scholarship has been established to help students at the Justice Institute of British Columbia (JIBC) obtain the education they need to contribute to the health and safety of their communities. 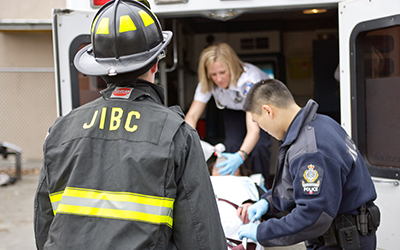 The BC Lung Association Healthy Lungs First Responder Scholarship provides tuition support for students in JIBC’s law enforcement, firefighting and paramedic programs. Applicants interested in being considered for the award contribute to broadening awareness of the importance of lung health by completing an essay on how first responders can better understand and deal with lung health issues they might encounter in their work. Applications are currently being accepted for the award. The deadline for the first BC Lung Association Health Lungs First Responder Scholarship is June 30, 2016. For more information about the BC Lung Association Healthy Lungs First Responder Scholarship or creating an award, contact The JIBC Foundation. Be the one – giving to student success.